He is monitored by Healer Artemisia Panax—his HeartMate, a love he never pursued. Still mourning his loss, he refuses to acknowledge her. Since her family was publicly disgraced, she’s used to such treatment. She wants nothing more than to guard her livelihood and protect the secrets she’s sworn to keep. When a wealthy young woman, obsessed with a childhood vision of a magical Shining Palace, sets out with her true love to search for a legendary land, she discovers the devastated WorldBelow – the realm of the Grass King – and the terrifying Cadre, who take her prisoner, and demand she either restore the king’s concubine… or replace her. I am reading this one right now, and it is sooo good. 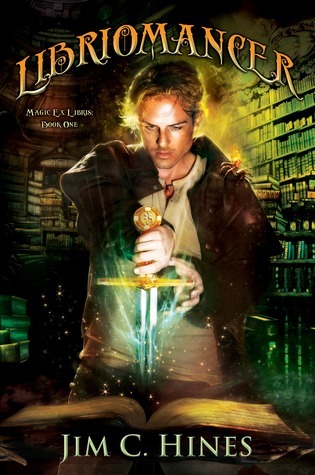 Isaac Vainio is a Libriomancer, a member of the secret organization founded five centuries ago by Johannes Gutenberg. Libriomancers are gifted with the ability to magically “reach” into books and draw forth objects. When Isaac is attacked by vampires that “leaked “from the pages of books into our world, he barely manages to escape. To his horror he discovers that vampires have been attacking other magic-users as well, and Gutenberg has been kidnapped. What books are you looking forward to read in August?